The BlackBerry Bold 9700 takes all of the great BlackBerry features from recent devices, as well as some new flair, and packs a punch that some will argue is the best BlackBerry yet. 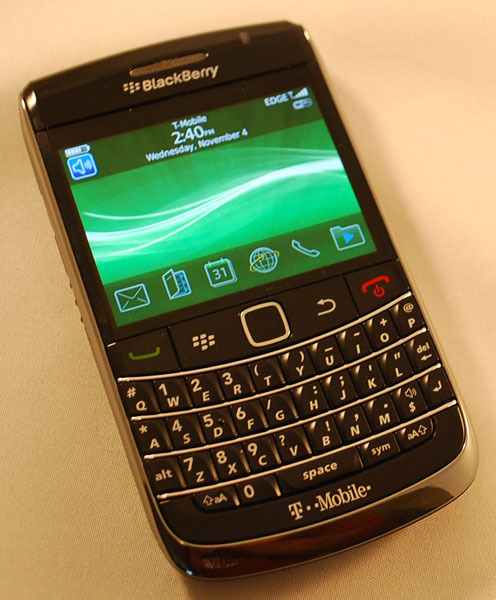 With an excellent combination of size, a great keyboard, trackpad navigation and BlackBerry OS 5.0, the 9700 is a force to be reckoned with. The device is perfect for both business users and consumers. 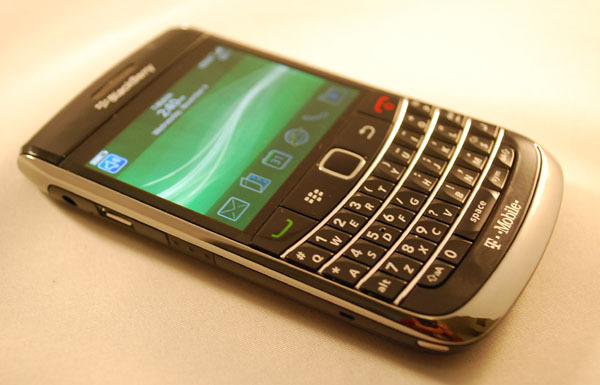 Those who are new to BlackBerry will have no problem adjusting to the new device as the OS 5.0 improvements keep getting better and better. Here we'll take a look at the best features of the device, and check out the BlackBerry OS including standard features as well as the latest OS 5.0 upgrades. The Bold 9700 is a great little device. It feels good in your hand, and the size makes it easy to handle. It doesn't have the "bulk" of the Bold, and is not nearly as small as the Pearl. The full QWERTY keyboard feels good to type on, and the keys are just the right size. The new trackpad (which was introduced on the BlackBerry Curve 8520) is a welcome relief to the trackball on other recent devices. The trackball was known to stick or wear out, so hopefully all those issues are gone for good. The charging port is well placed on the top left, and the convenience and volume keys are in their standard positions. The back of the device is smooth and the mock-leather battery door adds a nice touch to the overall feel. I like the overall feel of the device. The size is great - a good balance in the middle of the BlackBerry spectrum. I don't like to use skins or cases on my devices, so I like the fact that the back won't get too scratched up easily, and the sizes have a rubber coating to protect them from daily use. The screen is big and vibrant sp typing emails, instant messaging or watching videos are all done with easy. The trackpad makes navigating much easier than the outdated trackball. I don't fear that the trackpad will wear out, and as it has virtually no moving parts it just feels better all around. The command buttons and keyboard all feel solid, and if my Tour is any sign, will stand up to loads of use and never lose a beat. The charging port is in a good location and allows you to still type fairly well when plugged in. One of my only gripes is the low placement of the right side convenience key. It is lower than most, and I seemed to catch it a bit more when typing. When firing up the device, we are greeted with the new OS 5.0 boot screen complete with progress bar. Once started, the applications are neatly spread out on the homescreen and folders for easy access. 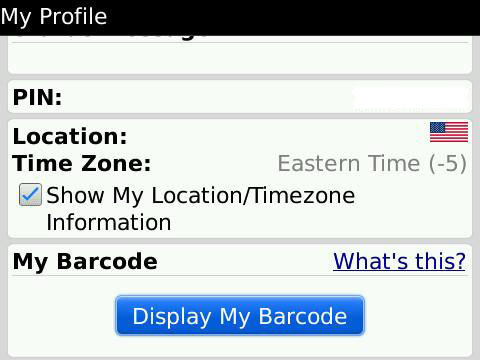 The T-Mobile BlackBerry Bold 9700 is running OS 5.0.0.330. This means some great improvements from earlier OS versions that are sure to make things easier. 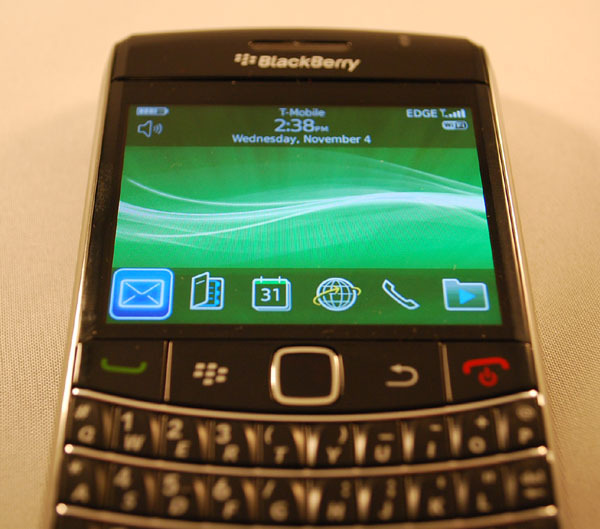 Pre-installed are the native BlackBerry apps that include calendar, memopad, tasks, messages, browser, camera and others. We can also find IM applications like BlackBerry Messenger, AIM, Google Talk and MSN Messenger. The clock, maps and various games round out the applications. 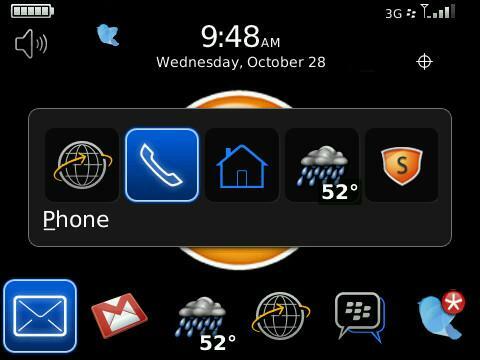 Lets take a spin through some of the new features that come with BlackBerry OS 5.0. If you are a seasoned BlackBerry vet these may not be new to you, but first time users can get a glimpse of what is improved in the latest OS versions. The new boot screen simply shows a "BlackBerry" logo with a progress indicator showing the bootup process. OS 5.0 adds the ability to flag emails with the new "Flag for Follow Up". This options notes a message with a flag and allows a reminder to be set for a follow up reply. BES users can also access folders as well. The date also now stays on top of the message list and does not scroll so there is no confusion as to what date the messages fall under. 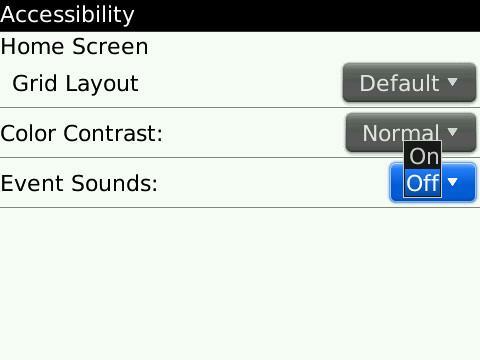 Users have the ability to resize images before sending via MMS, BlackBerry Messenger, Email etc. You may choose from 3 resolutions (only smaller resolutions are shown) and resize before sending. BES users will see some great updates in the calendar application, allowing for forwarding of events, conference call options and attachement viewing. The standard options for BIS users are still present. Allowing for daily, weekly or monthly views as well as the ability to add multiple events to multiple calendars, set alerts, reminders and more. 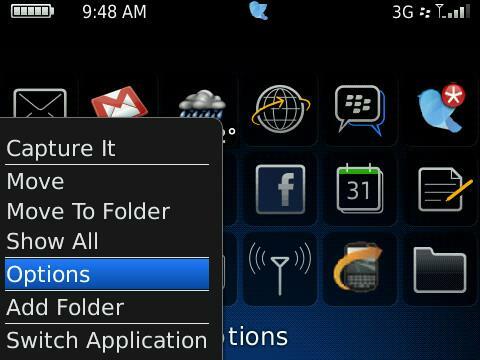 Users can now press and hold the BlackBerry button to activate the application switcher. 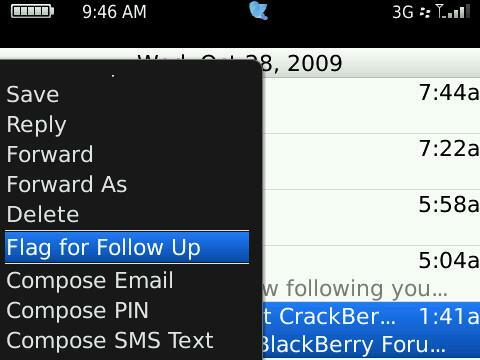 You may also press the BlackBerry button twice to activate the menu and take the default action. 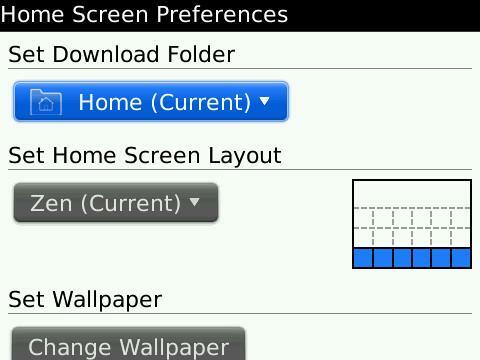 The addtion of the options menu on the home screen allows users to change wallpaper, layout, theme and choose a download folder. Users can now assign even sounds for the device. Sounds may be assigned for startup/shutdown, USB cable connect/disconnect and battery status. On previous OS versions the email setup was very simple and low-featured. The new application allows for full email setup as well as the ability to edit signatures and filters for each associated email address. The user profiles screen has multiple enchancements. A menu option is now available to edit the current profile and users can still access a menu to edit all profiles. The name of the current profile also now shows in the titlebar when editing. For each notification, users may select volume (silent or 1-10), count (times to play sound), vibration options and LED option. 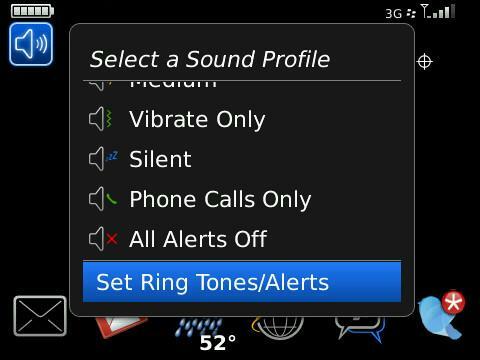 All profiles with the exception of Normal, Vibrate Only and All Alerts Off may be renamed or deleted. 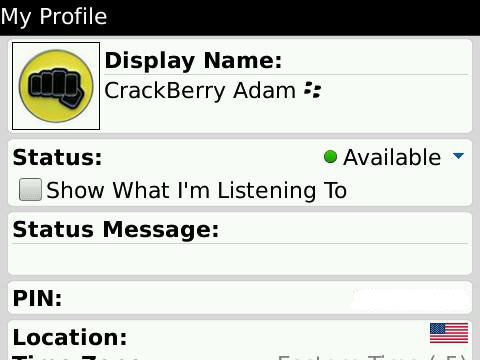 Although not bundled with the OS, BlackBerry Messenger 5.0 includes updates as well. User can now set avatars, locations and more. There is also the addition of groups, barcodes and other additions. For full features and usage, check out the Definitive Guide to BlackBerry Messenger 5.0. Overall using the Bold 9700 for the first time (or jumping in from another device) couldn't be easier. There is obviously a learning curve if you are a first time user, but that is to be expected. The new email setup options in OS 5.0 are an amazing improvement from previous versions. 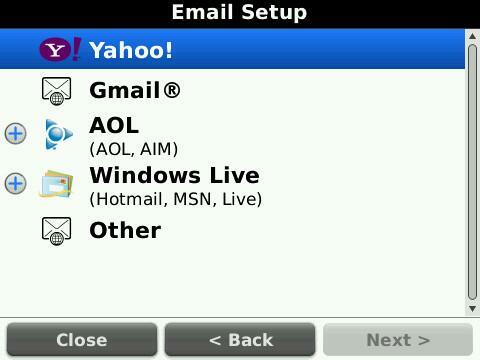 No longer is it a confusing mix of PC and BlackBerry browser just to setup an email address. 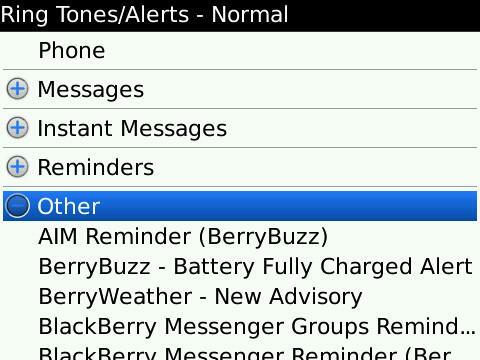 The messages, calendar and updated BlackBerry Messenger all round out an amazing device. 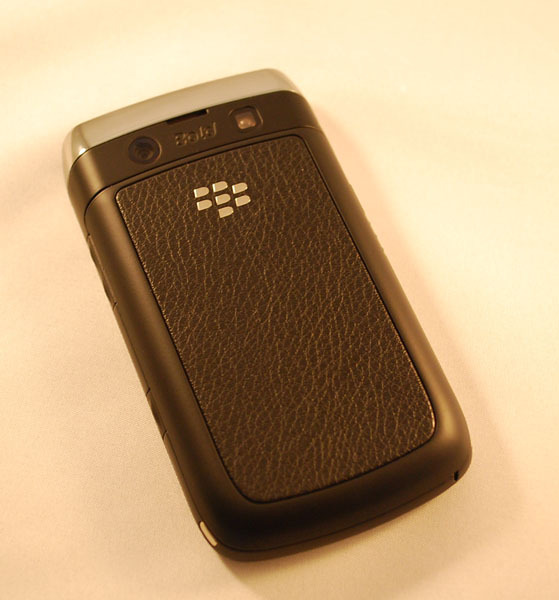 With the ability to find loads of free and paid apps to suit your needs, you'll be able to tweak your new BlackBerry Bold 9700 to your liking, and never go back to the "Dumbphone" world again.